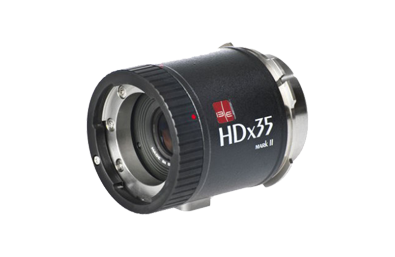 IBE Optics HDX35 Lens Adapter Hire/Rental from just £40/Day. Hire/Rent the IBE Optics B4-PL Lens Adapter from just £40/Day. This is a great way to stick a servo mounted B4 lens onto the likes of the Sony F5/55 or an E Mount can be put on for use with the FS7 for run and gun or long lens work. HDx35 optical adapters are mounted between B4 mount 2/3” HD lenses and the newest super 35 cameras and will cover all (4K) image areas.The adapter turns the B4 lens into a 2.6x longer focal length lens in which the relative depth of field expected for the larger sensor is achieved, while the usual field of view when the lens is mounted to a 2/3” camera is maintained. All HDx Optical Adapters also optically correct for the different spectral alignments between three-chip prism block sensors, for which the B4-mount lenses were designed, and the single sensor of the large sensor cameras. HDx Optical Adapters are highly telecentric in design, delivering a bright, sharp image across the entire frame, with excellent colour and contrast.